If you are lover of natural beauty at heart, you would consider to buying your own home that provides you with the beautiful scenery nearby. 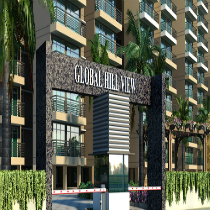 It can make you feel love of nature at the balcony of your home at global hill view Gurgaon. You can assume it, like you are sitting in the comfortable chair on your balcony with a cup of your favorite tea or coffee in your hand and sun rays are making your head bright. Yes, this is the most wonderful sight what you can imagine in your mind. It is not mere an Imagination, but it can be made real if you buy home with Breeze Global Hill View Sohna. The project is in the great location, and connectivity makes it much more exciting place for home buyers and property investors. If you are buying your own home with such projects you can bring your dreams come to live. This is really one of your most important decisions which you can make for your family requirements. You would be able to bring a pleasant sense to all your family members.